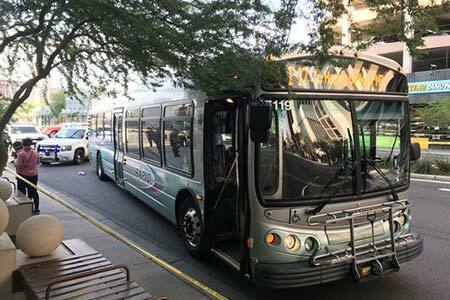 Phoenix, Arizona— Henry Rodriguez, age 34, was struck and killed by a City of Phoenix bus as he crossed a downtown street late this afternoon. According to witnesses, Mr. Rodriguez was crossing 1st Avenue, from west to east at Van Buren Street, as the bus turned south onto First Avenue at about 4:20 p.m. An officer with the Phoenix Police Department witnessed the accident. The 38-year-old bus driver has not yet been identified. Witnesses reported that it appeared Mr. Rodriguez had been dragged under the bus before becoming pinned beneath it. Erica O’Daniel, who works in a nearby sandwich shop, ran to the scene when she heard screams. She said as soon as the bus backed off the victim, he stood up. Witness Don Roberts reported that Mr. Rodriguez was very alert. Mr. Roberts heard Mr. Rodriguez say, “I’m going to die. You guys are going to let me die!” before he passed out. We extend our condolences to Mr. Rodriguez’s family and friends over this tragic loss.